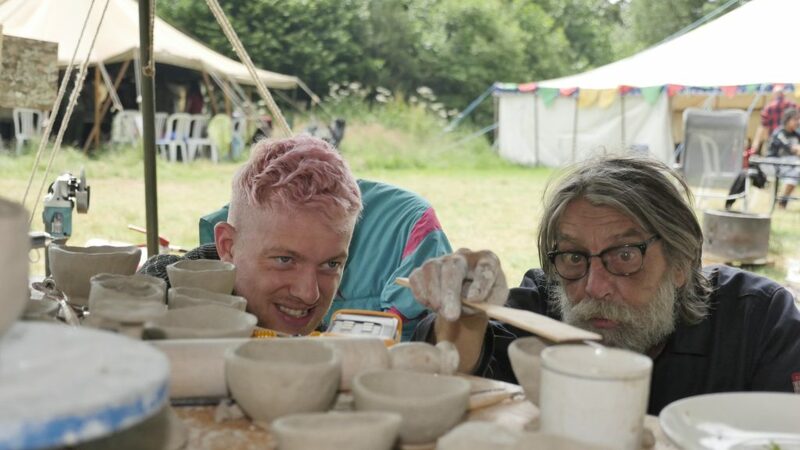 Radical Bakers is a relaxed and friendly weekend camping event with a chance to learn and share practical skills. 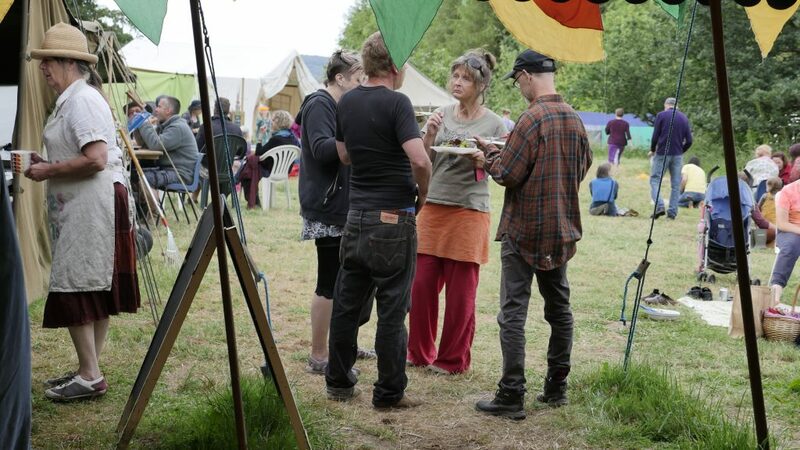 Focused discussions and hands-on workshops during the day leading into quality live music and dancing on the Green Dragon Solar Stage in the evenings. We offer fully catered tickets from our amazing caterer and our pop-up pub is The Baker’s Arms selling local ales, cider and craft gin. Our beautiful site is at Crabapple Community, one of the oldest housing co-ops in the country. Book your place here. We are a sustainable living gathering with a full programme of practical workshops. Get involved in fun group activities and join our temporary community. Full details of all the workshops below. Our focus is on food and sustainability: Brewing with Scott from the Rewild Project, Nutrition and Women’s health, Cooking foraged wild food with Chris Phyto, Cold smoking, Ayurvedic cooking, Mushroom Growing, Seed Saving, Bees, Wild meat and Medieval cookery with Kerstin. In the fermenting area: an intro to Fermented food and drinks with Emma from Wild Pickle making Sauerkraut and Kombucha. Making yoghurt with Dynamic fermentation, Lacto-fermenting wild food with Chris and more tba. The Bakery has a prep area with catering surfaces, organic flours, grains, grain mills, proving cupboard, 4 different ovens and a dedicated team. It is open all weekend for baking sessions. These include the Team Bake-Off, Bulk baking with Andy’s Bread, several Sourdough Baking sessions with one for beginners, Gluten-free bread, Making cakes, Healthy cakes, Young bakers and Milling grains. In our beautiful, creative Textiles Tent: Up-cycling textiles with Julie; Spinning, Dyeing and Textile sovereignty with Stella; Knitting with Cat, Crochet with Audrey and Textile arts with Bev Alder. Under our crafts awnings: Green woodworking, Willow crafts and Raku pottery. Ed Revill brings his charcoal oven, makes simple no-knead sourdough and talks about Soil building, Biochar and Smallholding. Radical Bakers has a full programme of practical workshops in nice canvas spaces, including: Orchards and forestry, Crafts businesses, Basic auto mechanics, Thermo-electrics, Solar power and batteries, Green Architecture. Herbalism at Radical Bakers includes: Ointments and salves and Colds and flu with Iain Stewart and a herb walk. For children we have organised activities with Precious Days, Kids crafts with Idle Beaver and a Kid’s baking session. Other activities include a tour of Crabapple Community and a morning choir. More to come. Click the links for a detailed article on each workshop. Contact us by email: hello@radicalbakers.org. The Green Dragon Stage is host to a great dance band and DJ each evening. Our Saturday night band are The Undercover Hippy. For your Friday night dancing we have The Bedrock Bullets. Our resident DJs are Rubberduck Disco. The whole event is totally solar powered: the stage and workshop spaces as well as the kitchen appliances and site lighting. We are committed to recycling everything we can. There are clean, working composting toilets (Treebogs!) by Biologic Design Ltd. We encourage people to use public transport and will be running a free shuttle service from Shrewsbury train station (you must email us well in advance so we can co-ordinate lifts). The ticket price includes all the workshops and entertainment, booking fees, camping and parking from Thursday to Monday. There are no hidden costs. Concessionary tickets are available if you are on a low income. If you have any questions not covered on our Info Page, or want to offer a workshop or skill-share, please email us on hello@radicalbakers.org. Check out all the pics from previous years events on our Facebook Page, or join our Mailing List for a monthly newsletter. Radical Bakers is a small, friendly gathering with a focus on learning and sharing skills. We believe in personal responsibility and empowerment. We want people to take away skills and information that they can use to improve their lives, and the lives of those around them. Our goal is to live more sustainably. There are a total of 150 Adult places. Book now as we sell out early.